Amy’s first card is masculine while still feeling casual and fun. She grounded her focal point by doing a bit of creative sponging and it looks absolutely perfect. The soft diamonds in the background make a splendid subtle backdrop for her scene – almost like understated wallpaper in a den. On this card, Amy went a decidedly feminine direction. 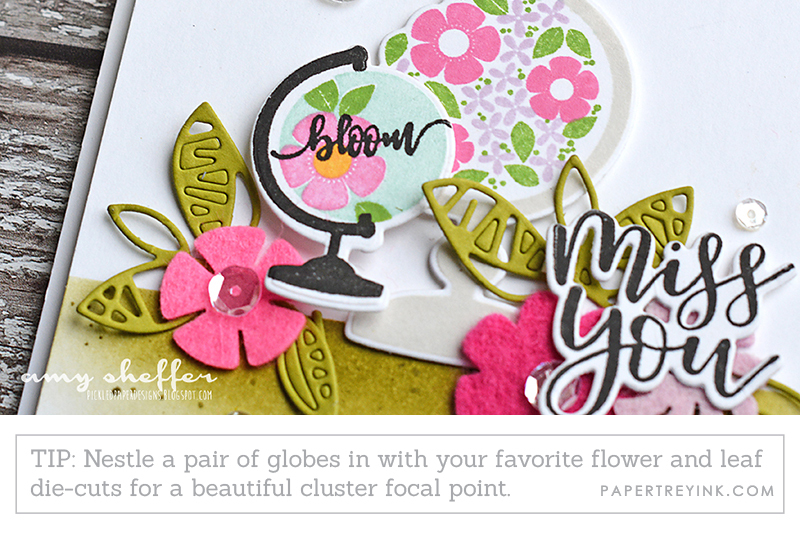 The clusters of felt flowers and die cut leaves are stunning with the stamped floral globes! And again, grounding her focal point with a sponged base worked beautifully. The addition of the speckles is just right. The bold and modern palette of Amy’s last card is absolutely wonderful. The metallics really pop against the striking color scheme. Using the Shape Shifter circle as the focal point is a great way to incorporate loads of marvelous texture and interest. 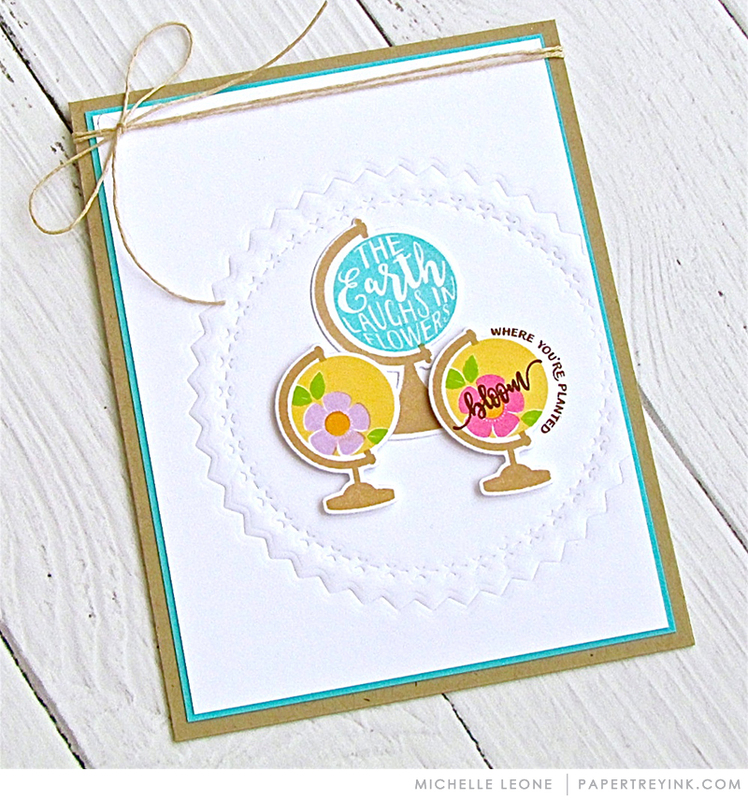 Melissa chose a soft, soothing color palette for her first card of the day. She left all of the negative pieces in the spaces of the Celtic Knots frame so she was able to accentuate the details without having to struggle to hide adhesive. 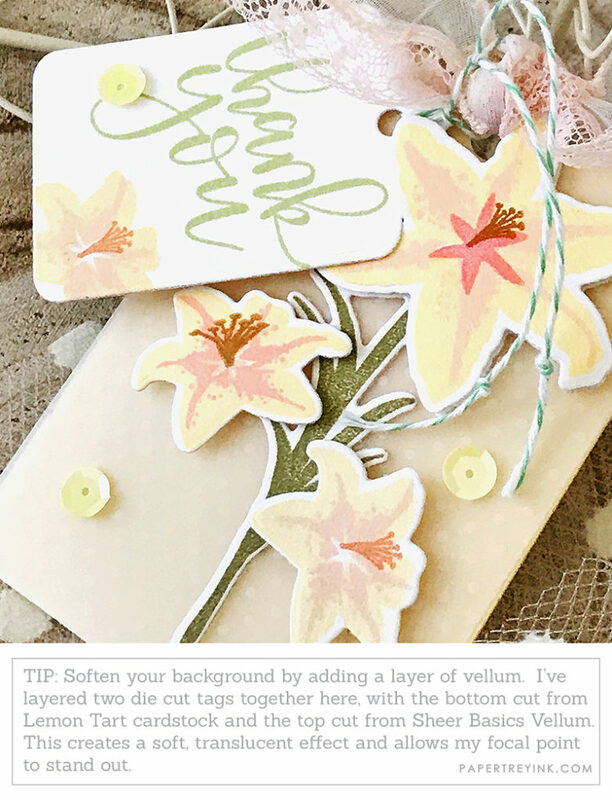 She also layered patterned vellum over colored cardstock to mellow the color a tad while adding a bit of interest with the pattern. Very elegant! 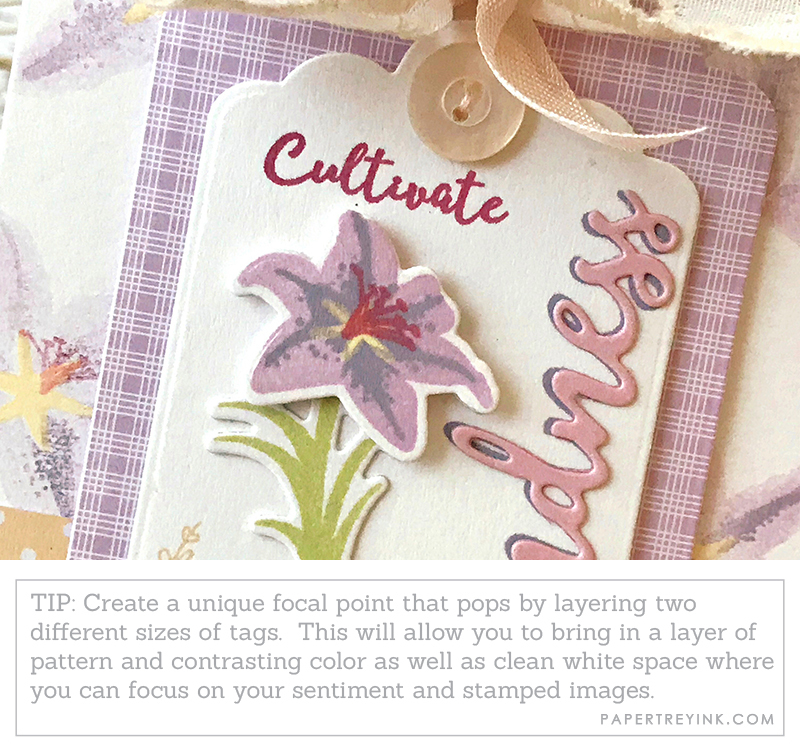 Using tags as focal points is something that Melissa does incredibly well and this card is no exception. 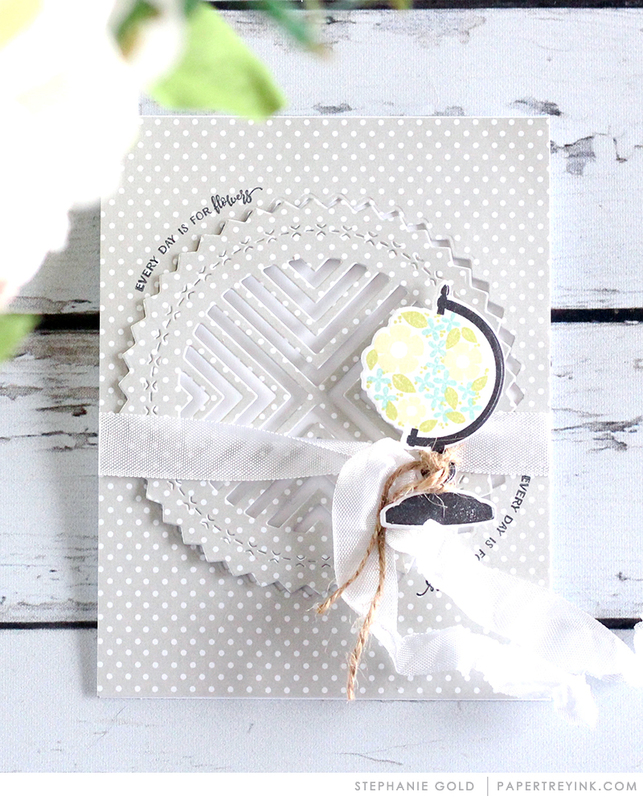 She used two different sizes in order to incorporate a mat of patterned paper. Repeating the focal point in softer colors in the background is such a lovely way to bolster the theme without being too matchy. Isn’t the lily on Melissa’s tag just so very cheerful? 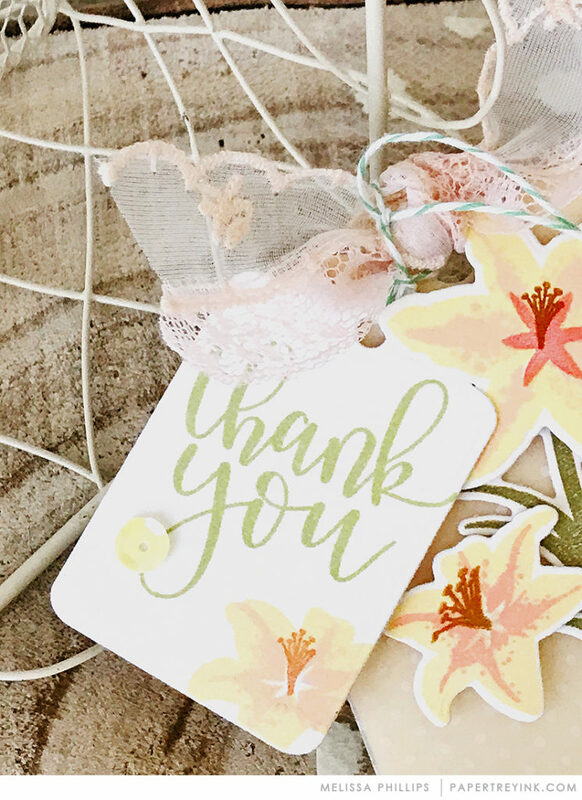 The yellows and oranges are such uplifting colors, ideal for a thank you project! Melissa also created one of her famous “junk bows” and it adds such dimension to her project, wouldn’t you agree? I hope you have enjoyed all the creations that we have shared with you today! Have the beautifully painted globes on Pinterest piqued your interest? Now you can stamp your own! And thanks to Betsy’s lily set, you can stamp these stunning flowers in any color of the rainbow. We would love to hear your initial thoughts on everything we introduced! Please leave a comment on this post to tell us what you think of the new products and you will be eligible to win big! And now for even MORE inspiration from the rest of the team! To see more from Betsy Veldman, CLICK HERE. To see more from Heather Nichols, CLICK HERE. To see more from Laurie Schmidlin, CLICK HERE. To see more from Lizzie Jones, CLICK HERE. To see more from Michelle Leone, CLICK HERE. To see more from Stephanie Gold, CLICK HERE. To see more from Betsy Veldman, CLICK HERE. To see more from Heather Nichols, CLICK HERE. To see more from Keeway Tsao, CLICK HERE. To see more from Laurie Schmidlin, CLICK HERE. To see more from Michelle Leone, CLICK HERE. To see more from Stephanie Gold, CLICK HERE. Create a project utilizing your take on the challenge. Your project must use at least one Papertrey product and use one of the color combinations provided from design team projects posted today. Please enter new projects only. Post your project on your blog, in your gallery or on any other photo-hosting site (such as photobucket or flickr). Add your project to our InLinkz list below. ONLY ONE ENTRY PER PERSON PLEASE. You can also add a comment to this post for a chance to win. ONLY ONE ENTRY PER PERSON PLEASE. You will have until 6am ET, Saturday, February 17th, to add your link to the list to be eligible to win. Two randomly selected winners will be chosen from ALL the entries on Saturday, February 17th. Winners will then be posted on our February 2018 Winners Page. 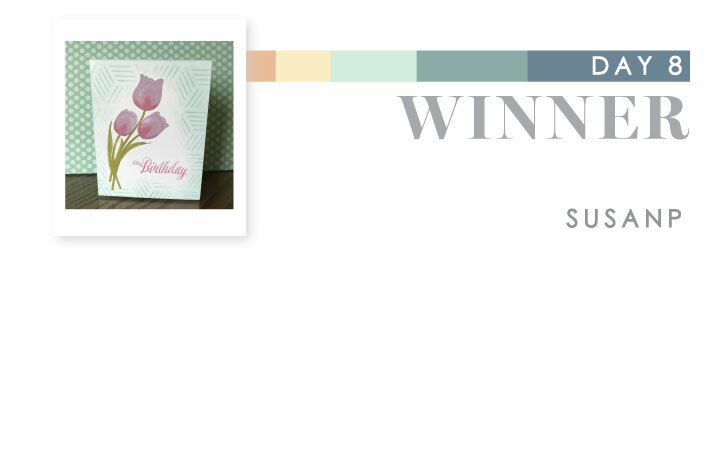 Two randomly selected winners will get a $100 PTI gift certificate to spend however they like! The globes are really cute! I have a few vintage globes that I use as decor in our home. Fun! Love the lilies – my favourite flowers and the layering is just perfect. Love those lilies and the shap shifter circle-like the mix and mats-what a great staple to have. Thanks to the design team for always creating great products. Loving the globe and the shape shifters die, can’t wait to see more shape shifters! Love these stamps, ladies. And the cards are gorgeous!! The globes are so cute & different. It never ceases to amaze me at what the design team comes up with. The Glorious Globes are adorable. I really like the Words to Live By: Kindness set. Shape Shifters!! Wow! Lilies of the Field and more scripture sets, and so much more! Can’t take it all in! Such gorgeous projects from everyone too!! Finally! I feel like I have been asking for globes forever. While I’m not overly excited about the flowers for Feb. I am excited to see all the additions throughout the year. I’m sure a number of them will have to come live here! The shape shifters will be in my cart. Looking forward to more scripture stamps. I love the lillies and the globes and their sentiments are pretty cool too. So excited for Shape Shifters! And I think the globes will make awesome guy cards. Yay!! The globes are fantastic!! I also really love the circle dies. I look forward to seeing what each month brings for both of these series. Oh I love the glorious globes! The images are so pretty. Love all the fantastic designs today. I love the direction you have taken over the past year with these mini set series and am thrilled to see them continue. I feel like I am getting a lot for my craft money; for that I thank you. Great designs. Betsy, you’ve knocked it out of the park with these lilies. They’ll become a go to for certain. All good things! The globe set is so fun, the kindness set are words to live by and the flowers are lovely. Betsy’s bright and happy Easter card stuck out to me today. Great inspiration. Love the new word series! Happy anniversary, PTI! The globes are cute and I love flowers. Lilies are my favourite. The globes intrigue me and the circle shifter dies. One of the main reasons I LOVE Papertrey is because the designs are always fresh and fun. And the Globes and Lilies are too! Not normally a lily fan but the designer projects are stunning! 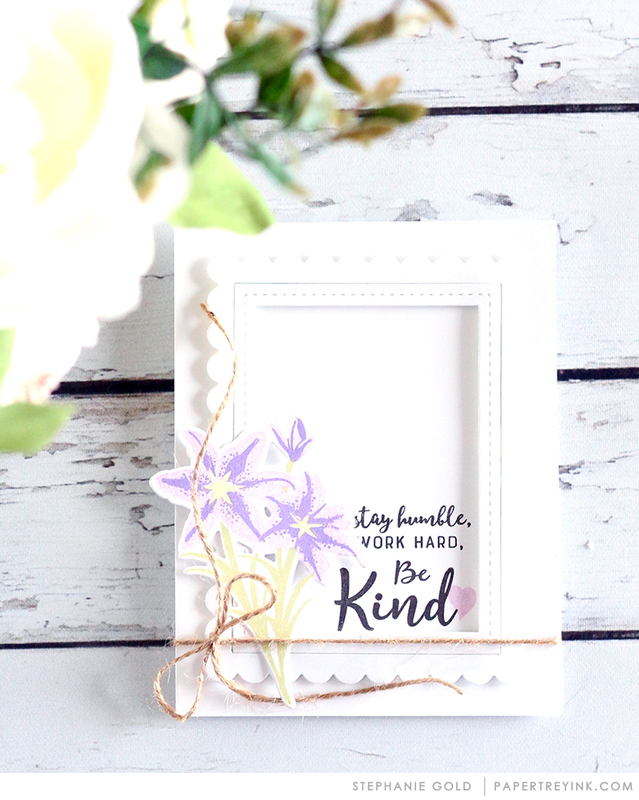 My favorite new product today is the kindness sentiment set! The shape shifters will be fun! The globes will make for some really unique cards. Looking forward to seeing each month’s addition. The projects with the Lilies of the Field set are beautiful, especially Betsy’s! Excited about the new sentiment set too. Omgosh Amy’s card is beautiful!!! I love how she used other stuff with the globe stand image. Loving the Globes and Florals. 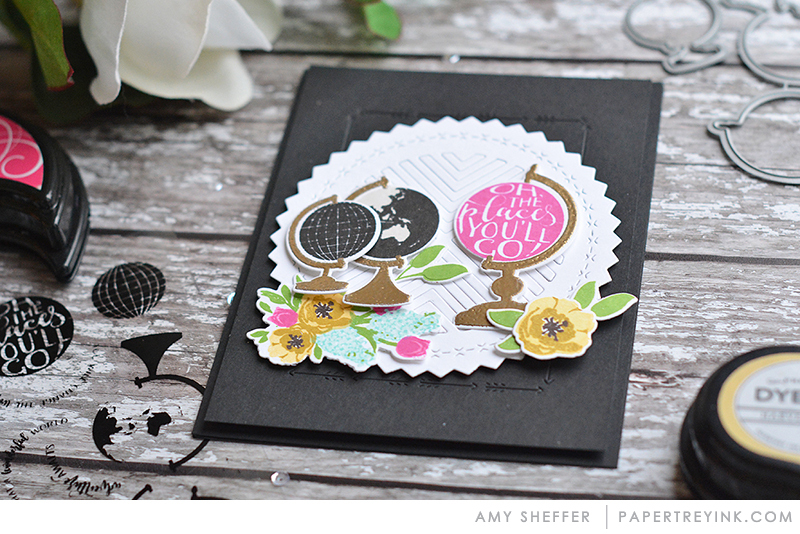 Amy’s card with both is GORGEOUS! The globe is an awesome die! All the cards are fabulous. Oh, those globes are fabulous! I always love being inspired by the design team’s colour combos! I love the lilies! They are gorgeous. So in love with the lilies. I can see the globes being used for masculine cards as well. Great release! Love the lilies! They’re gorgeous! I love how the double tags were used and the smaller tag used with the larger tag. Great projects! The Lilies are wonderful. Melissa’s projects are simply perfection to showcase this lovely set. Cheers. Love the globe and Love the Shape Shifters! Can’t wait to start collecting all the Shapes! Betsy’s lilies are so beautiful too! So much goodness! 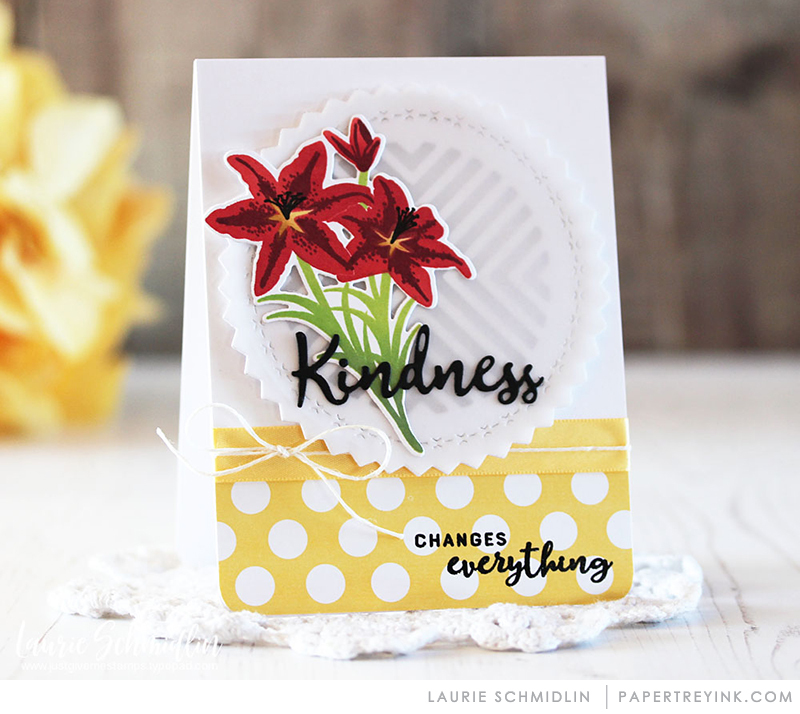 Speaking of goodness – LOVE the kindness set too! So inspired by what the design team has done with these new products. Just lovely! The lilies are gorgeous on cards. Love having a new floral set! Happy Anniversary! Love the shape shifter circle & the words to live by! Fabulous inspiration by all! Wonderful, every month PTI designers hit a home run! I love the new globes and the new shape shifter dies!! I really love the globe concept. So fun and terrific for a travel bug. Beautiful samples by the team. The lilies are stunning! especially love Heather’s card with scarlet jewel and white ink on kraft. And I’m excited to see the new Shape Shifter series! So happy to see a globe set with Asia and the other part of the Southern Hemisphere! Much needed for my stamping arsenal. The lilies and globes are really great sets, but I just LOVE the new Shape Shifter series. Very fun! Love the Kindness dies and stamps. Great projects today! Great release day! I love the globe set, it´s great. And the shape shifters dies, can’t wait to see more from them! Very nice showcase today team, thanks for all the shares. Love the Glorious Globes! I’m looking forward to the series. Love the new globe set!! The new Shape Shifter-Circle 1 is an exciting new addition to PTI’s dies. I look forward to seeing what’s next in that line! Yay! The lilies today also caught my eye! Keep the goodness coming PTI! I LOVE the shape shifter circle dies! And Melissa’s cards using Lilies of the Field are stunning. Love the soft colors. Great projects, ladies! Love the globes and the additional month add-ons. I see so many possibilities. More wonderful releases and fantastic inspiration! I’m excited about the words to live by series! Kindness is a wonderful way to start it!! The globes are a great addition and can be used for cards, scrapbook pages, treats…for many different occasions. Nice twist on the globe set having flowers on them. The lilies are pretty, very nice. I love the beautiful lillies & look forward to using them on my cards. I also love the new series, Words to Live By & the Shape Shifters. This is going to be another great release as always! Thank you! I love the Globes!! Such a great set!! The Shape Shifters will definitely become a favorite too!! So many beautiful samples from the design team! I always want everything when I see their works of art. Loving all the pretty supplies today. Love all the globe varieties and the lilies are beautiful. Beautiful product, beautiful cards! Win-win!! Thank you for the chances to WIN! I work in an elementary school and we are celebrating Kindness week this week. Love these stamps. I like the Shape Shifters and the globes are interesting. Looking forward to more of these. Those little floral globes were such a delightful yet unexpected surprise! They are just the cutest. And, wow, on the shape shifters. Goodness, the choices are going to be so plentiful this year. How is a girl to decide? The Shape Shifter dies are fabulous! I can see so many possibilities for them. What an awesome release & it’s not over yet!!! Yay!! Beautiful cards! So many great new products!! Another day of fabulous inspiration! I love the globes, the flowers, and so many color combinations. Just lovely. Happy Anniversary! Great quality products as usual. Just awesome! Always super pretty projects! Still loving the downloads for the colors, but would love to see sketches as well each month. And the lilies are gorgeous! Such beautiful work from the whole team. I’m surprised by how much I love the globe set…Stunning work! Love those globes! The monthly add-on sets are so creative! Thank you, DT, for such a wonderful anniversary release! Wow–gorgeous products! I’m so excited to see that there will be a new series of 3 dies but circles instead of rectangles! Am loving the Shape Shifters. So many lovely projects! Exploding with gorgeousness!! Wow! Love the globes!!! Beautiful stamp sets and projects today!!! Words to Live By: Kindness is absolutely my favorite today! I didn’t think I’d like the Globes but after seeing what the DT did with the set, it’s on my list! Each day I marvel at all of the new designs, stamps, dies…don’t know how you manage to consistently create new goodies every month. Fabulous team, ideas, tips, designs, cards…and…I want to buy it all. The glorious globes are soooo clever. I love them and the zillion ways to use them. The shape shifting dies are going to be a great addition. The lilies…gorgeous. Thanks for another inspiring day of releases. Love the lilies and globes! Beautiful samples! Another great day to love PTI! The lillies are gorgeous along with the scripture. And Lizzie, as soon as I saw those globes, I thought of yo u! Love the new circle dies! And can’t wait to see what goes along with those globes month after month! 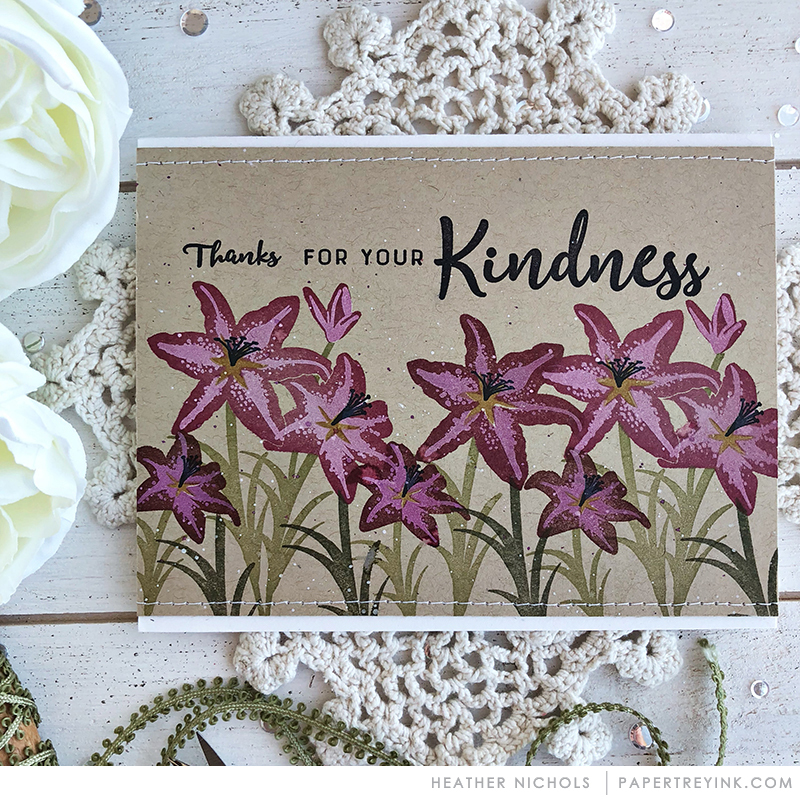 I’m loving everything in today’s reveal–the lilies, the globes, and the kindness set! I can hardly wait to have these in my stash! I love the lilies. Thank you for all of the fabulous inspiration. Betsy’s Lillies are just beautiful! More beautiful projects today. Love the lillies. Bring on Spring! Love the kindness words to live by and those globe’s look like such fun! As always love the inspiration given by the projects! More great sets and dies! 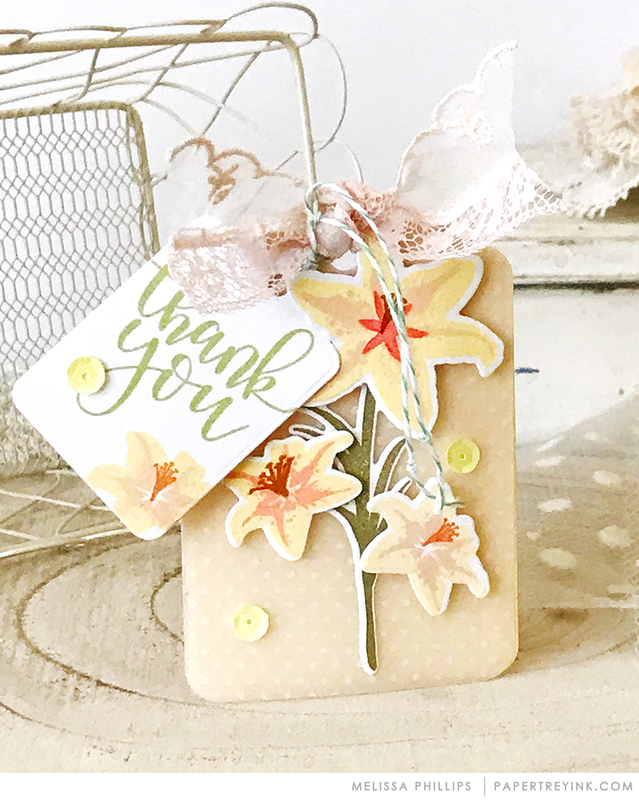 The lilies will be so timely for Easter cards, but versatile enough to be used throughout the year. Beautiful samples for the color challenge today. The new SERIES of stamps and dies are going to be so much fun looking forward to each month! Yes! The globes! Been wanting a cute globe set for quite awhile! Love this one! The lilies are so pretty and I am thinking those globes would work for graduation cards!! Oh My…more dies, I can’t resist!! Every day is full of awesome new products and projects. I love PTI! I love the Shape Shifters! Love the Glorious Globes–can’t wait to use that on my projects! So much fun and creativity this month! I really like the new globe set and am excited to see that it will be a monthly release with new stamps to go with it. How in the world have we made it 11 years without globes? And new globe images each month…hooray! Thanks for all the clever inspiration. Love the Shape Shifters and can’t wait to see the rest of the series! Already know that I am going to love everything in the Word to Live By series. I didn’t know I needed a globe set…until now. You’ve done it again, PTI! Fabulous projects from everyone! Loving those globes and the shape shifters. The anniversary celebrations and product reveals have all been amazing so far! Those globes are too cute! Lots of great inspiration today!! Love the first circle die in the shape shifting series! Can’t wait to see what is next! Great new items and wonderful creations! I’m just loving what Amy did with Glorious Globes! Love the lilies, especially the soft colored ones. They are beautiful. Thanks Melissa and Betsy. And I am so happy to see Amy’s cards. I love her work. 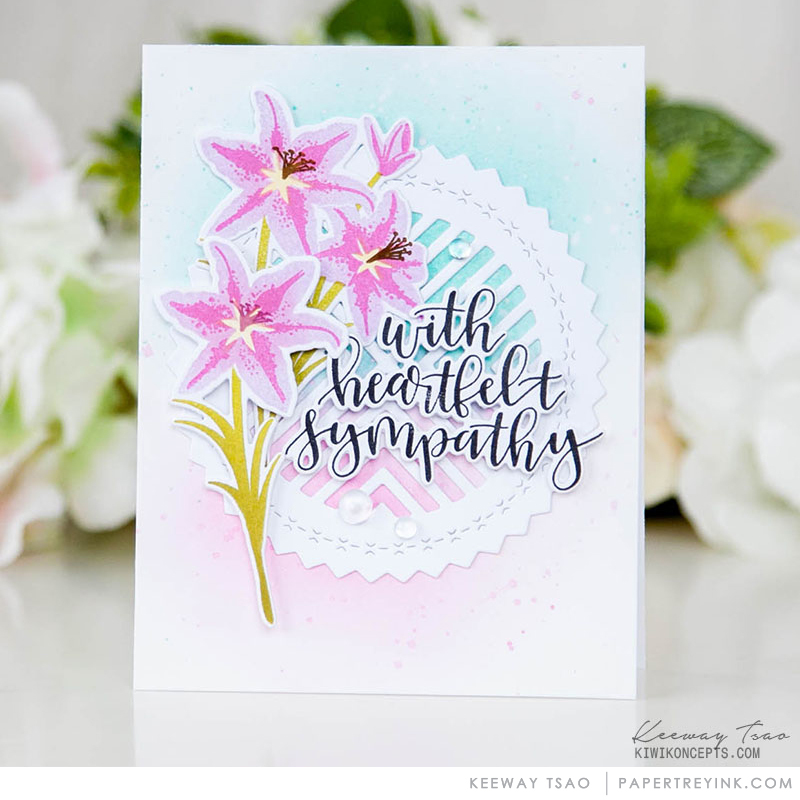 Love the lilies and the shape shift series – can’t wait to see more! Oh my! Love Betsy’s new line, Shape Shifters! I’ll be collecting these for sure. Also love the new lilys…just in time for Easter! 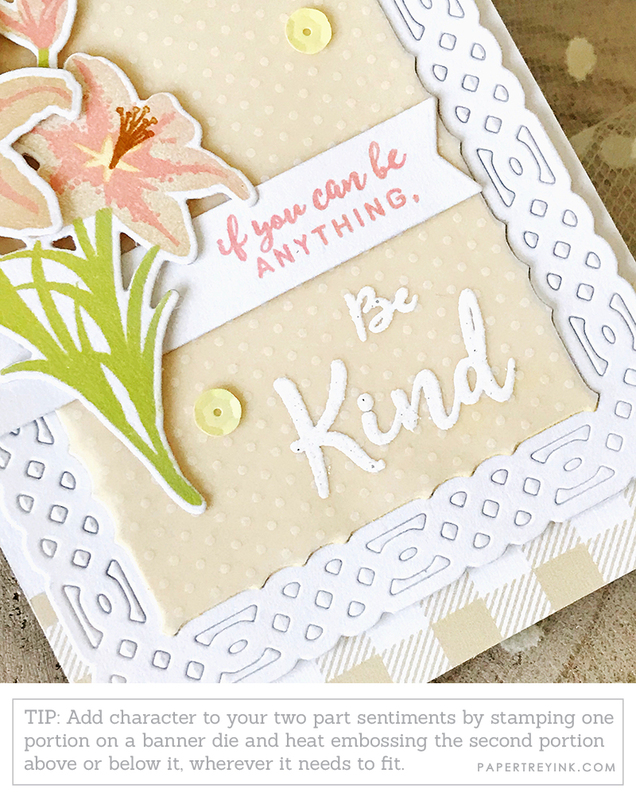 I’m in love with the shape shifters die and the new lilly stamp set! I can’t wait for the entire release! So many samples using the new globes – very creative ladies! Love the Words of Kindness and dies—great new series! The lilies are gorgeous! Always reminds me of spring. Lovely projects! I love globes, and have admired all the gorgeous altered ones out there over the years. How fun to be able to craft my own masterpieces with just a few stamps! Really excited about Betsy’s new shape shifter dies as well. Oh my! Today’s new featured products will most certainly take my cards to a new level. The Shape Shifters: Circle 1 is just perfect for grouping images. I will use it so often! What a perfect way to begin the WTLB series! Kindness is one of my most treasured words. The lilies transport me to my cottage gardens, on a late June day, where they bloom in abundance. The globes appeal to my sense of wanderlust and concern about our fragile world. The wonderful Papertrey Ink team is speaking to my heart. 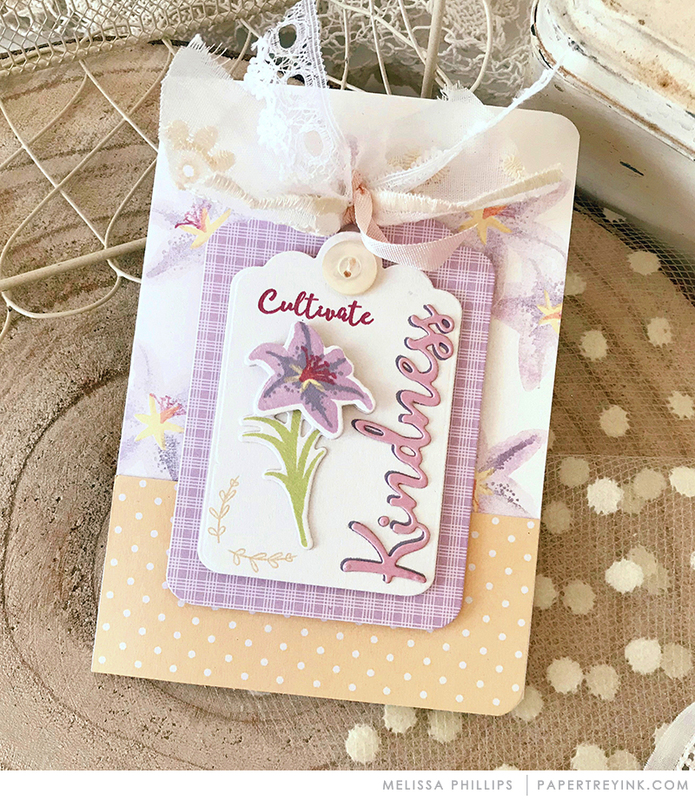 Celebrating kindred spirits as we craft a global community of kind, caring card makers! ? Another day and another round of new, amazing products to tempt me! 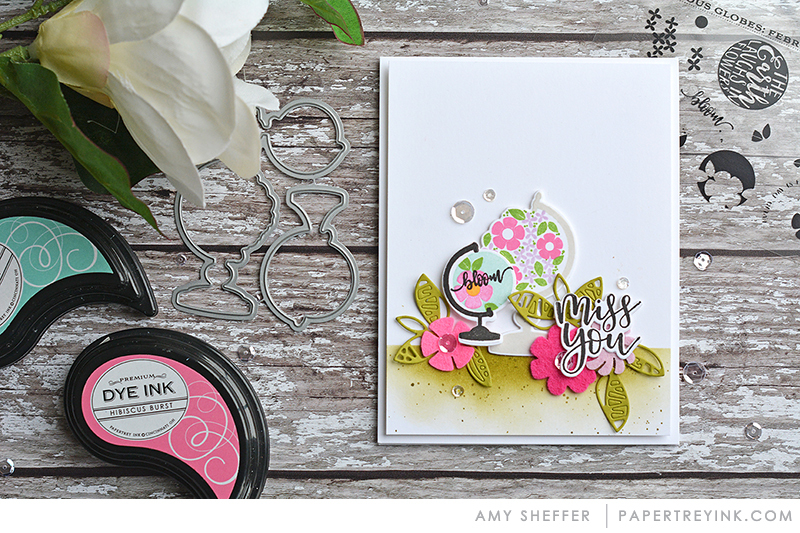 The Shape Sifters are definitely a must-have – ditto with the beautiful lily stamps! Looks like there are some great series for 2018! And I can’t wait to see more Shape Shifters! Those globes are so cool and will be great for graduation cards, too. Shape Shifters sound awesome and can’t wait to see more. Who doesn’t like lilies and of course, words of kindness? The DT just blows me away as I wonder how they continually come up with such unique color combos and gorgeous creations every. single. time! Love the globes – very unique! Haven’t seen another stamp set like that one. And the lilies are lovely – I can imagine them in all sorts of colors. The designers really did a wonderful job with their inspiration projects! Thank you for the chance to win!! I love the lilies. Perfect for Easter cards. 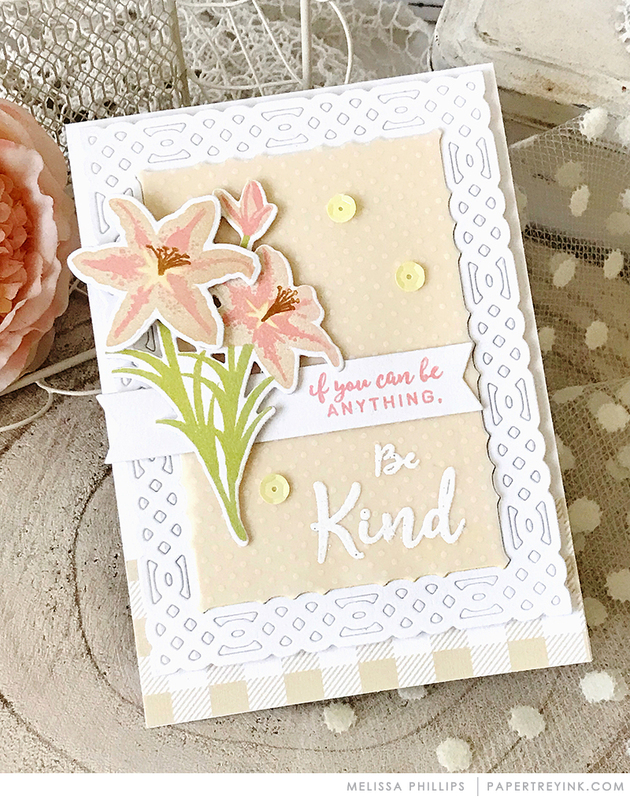 Gorgeous cards and exciting new products! Every day keeps getting better and better. What a lovely day of previews! Loving all the new series to look forward to this year! I am intrigued by the new Shape Shifters! What a great idea! Love the globes and beautiful lilies! What beautiful projects you all made! A treat for the eyes and creative spirit! Beautiful projects, I love seeing the products up close and I’m always inspired to see how the team uses them. LOVE the lilies best! 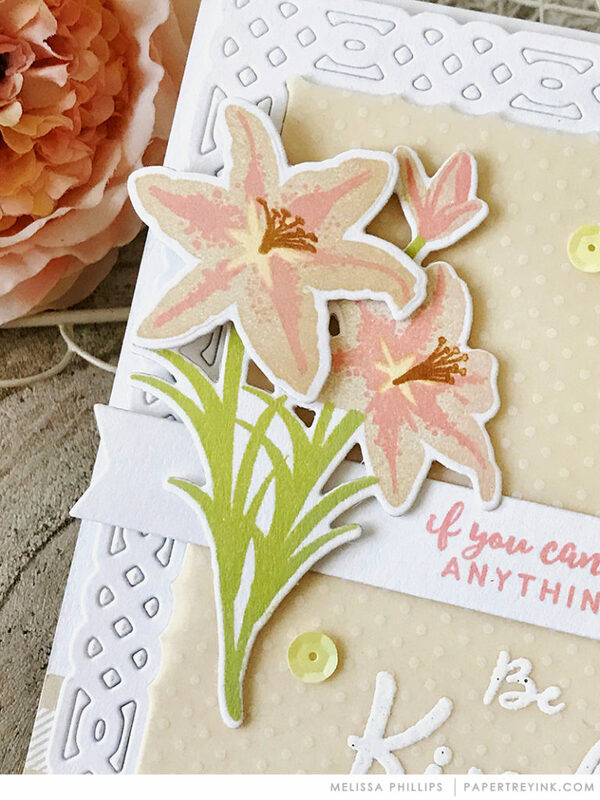 Love the Shape Shifter die set and the lilies are gorgeous! Fabulous cards today!! Yippee for Shape Shifters-love the circle shapes & how everyone used them! Looking forward to seeing the new series Words to Live By-love this idea. Great job design team-I’m making a huge wish list already! I am really liking the Kindness set. It is such a soft encouraging word that I want to keep in my thoughts. And everything in todays post looks like delightful fun to work with: the globes, lillies, Shape Shifters, and the hints of more to come. The globes will be so much fun to collect, and I want to pair them with Dawn’s suitcase set. Beautiful color combos for the Challenge today. Love all of the floral cards samples! Such beautiful inspiration. Really like the circle mix and mat dies. I hope they release a new one each month. Just love the inside pattern. What great colour combo’s! All the cards look fabulous. I really like the kindness set. I don’t think I would ever touch a globe set, but out of the cards above they are my favourite. I just love the flowers in them. What a great idea! And now to decide what colour combo I want to make for the challenge. I am in love with the Lillie’s today. So beautiful. I love maps, I love globes, I love my GPS! These globes are fantastic. Love the new frames by Betsy called Shape Shifters, thus opening a whole new group like Mix and Mats. Great minds. Lilies are my favourite and I love the many samples on today’s projects. Who knew that a globe set could be SO versatile?!? Awesome inspiration today! I love it all, but I am over the moon for the shape shifters! I loved the Mix & Mat series and hated to see the end of it. How pleased I am to see the beginning of the Shape Shifters series! I’m sure these will be every bit as versatile as the Mix & Mat. My head is spinning with these wonderful creations! Loving all the products, cards, and colors! Oh my! I really like Glorious Globes, I liked it the minute I saw the sneak! Some more great monthly series to look forward to. 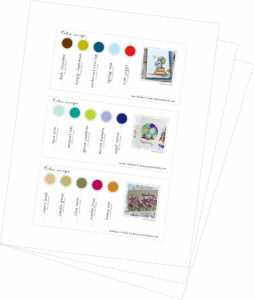 I wish I had time to play along with the challenge – so many inspiring color schemes to work with. THE globes are so cute and the lilies are perfect for Easter. One of my favorite flowers. 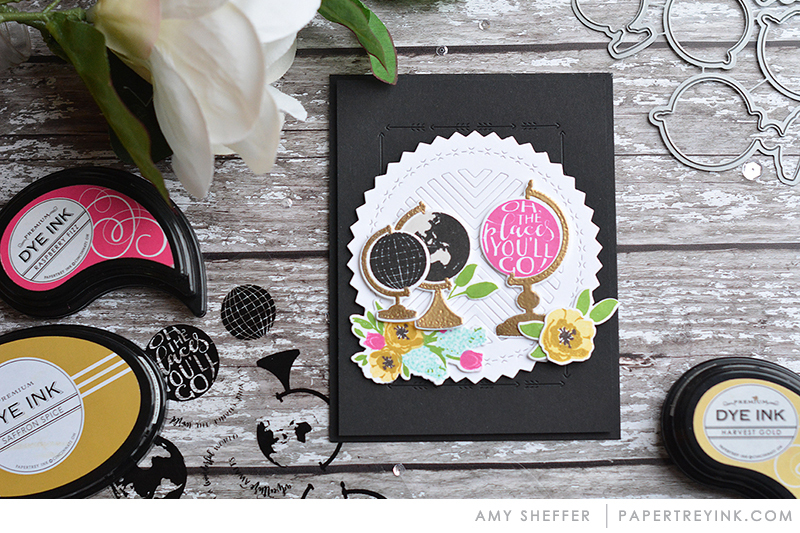 LOVE the looks of Shape Shifter: CIRCLES 1 dies! Beautiful release today…love the globes and excited they will be a repeating series. All Betsy’s new products are beautiful and are must haves. Nice work today DT…as usual! The globe set is my favorite! Am super excited about this set and the DT samples are simply stunning. Love the concept and gentle reminder of Words to Live By. I’m curious to see what other styles of globes you reveal over the next several months. It’s a great series! Ooo . . the glorious globes look awesome!! So many gorgeous color combos and beautiful projects! I love all the inspiration I get from PTI each and every month. Your Design Team is Number 1! Love all the wonderful color combos! Truly beautiful and inspirations projects today (and every day!). The Globes are wonderful and the Shape Shifters are going on my list for sure! I’m so inspired with the card designs. Love the globes, lilies, and Shape Shifters. The cards today were so inspiring! Love the Kindness! Such creative inspirations by the design team! Oh the globe set is so unique and fun! Love the different things you can do with this! 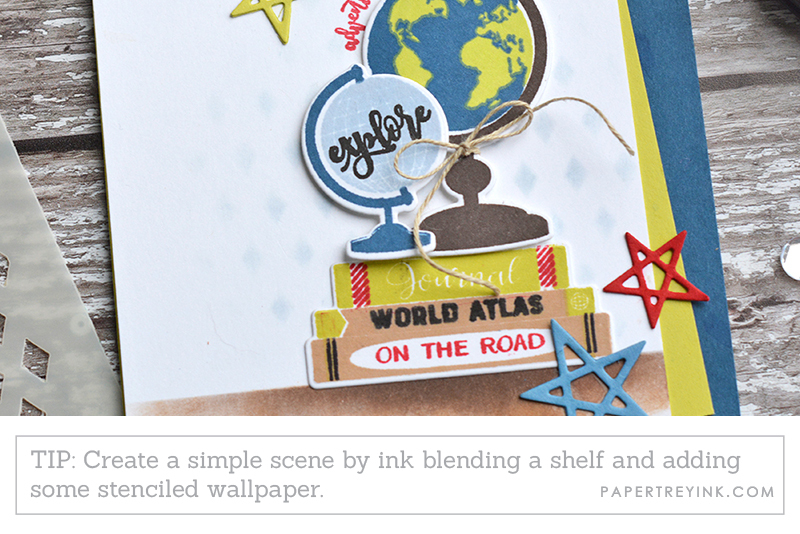 While I think of globes as travel-type stamps it looks like you’re going to design sets to make them everyday stamps. I love it when stamps are stretched and can be multi-purpose. Great cards !!! Pretty color combinations. Thank you for including a globe with Australia on it! And “oh the places you’ll go” is something I love to read & say to my kids. Perfect! all projects are great. I just love what Betsey did with the lillies and sun shine rays. Wow. Oh those globes! So fun and so much potential! I love the different centers / fillings … what a clever idea. Thank you for inspiring us, PTI Design Team!!! Thanks for all the challenges! I love the lillies and the globes. Such colorful projects. 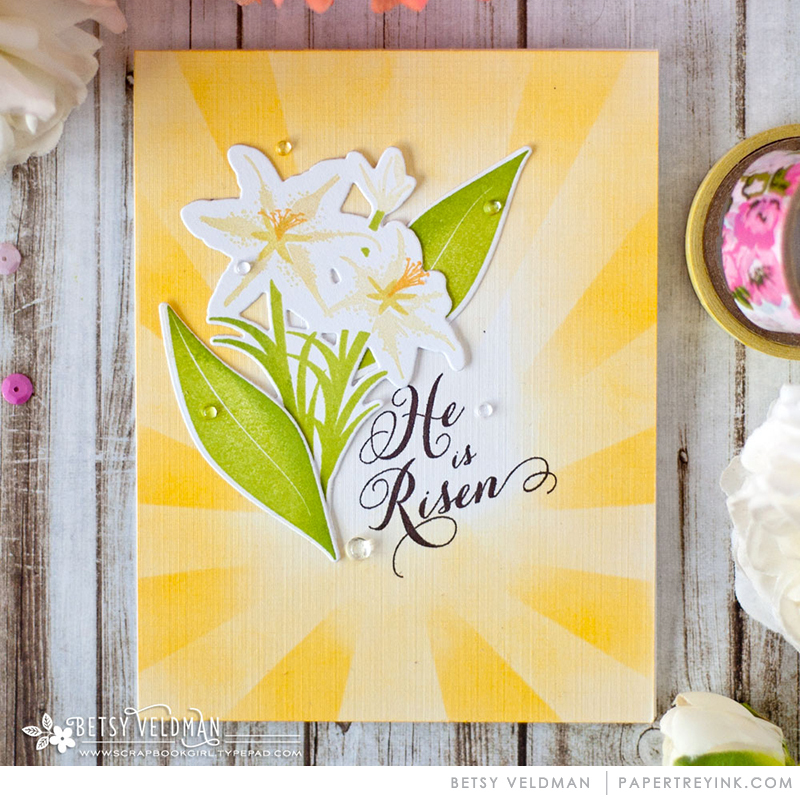 I love the lilies in the He Is Risen card-great job! Great card! I love the idea of looking forward to a whole year of globes and see ing where they will take me! Loving the shape shifter circle too, so useful! I’m loving the globes! They are a little something different from anything I have in my stash. They would make awesome guy cards. The globe set is so original! Love it. I really love the lilies – so pretty! The Lilies are great. Just in time for Easter.Loved Betsy’s card with the yellow sunburst. I put those stencils in my cart. Love the lilies, that is one flower I don’t have and will be happy to add it to my collection. The little globes are so cute! I can think of tons of ways to use them! This release just gets better and better! I’m soooooo excited about the globes! Looks like Betsy’s shape shifters will be just as addicting as her mix&mat series. Since we love to travel, I am really excited about the globes stamps and dies ever since the sneak peek video. The Globe set is really cute and loving the shape shifters as well. How clever!! Wow! This is turning out to be one of the best releases ever! Great products and the inspiration to use them! Absolutely love the concept of the Shape Shifters!! Cant wait to own them. I love the new shape shifters die, can’t wait to see what else is coming in that series! Love the lilies!! I like the globes and the Shape Shifters Circle a lot. Looking forward to monthly updates to both lines! Thanks for all the lovely inspiration. Super fun release, and happy birthday once again! I’m not a fan of real lilies, but these stamps are gorgeous! The lilies of the field is a beautiful stamp set. Love everything the design team has created with set. Betsy’s shape shifter dies are another must have just like the mix and mat dies. When I first saw the sneak peek of Glorious Globes, my first reaction was, not for me. Now I’ve seen some of the design team projects, I’ve had to change my mind! (Don’t judge a book by it’s cover springs to mind). And it has New Zealand included on the map too! I’d never have thought of globes as an entire set but I’m excited to see more. But the lillies? Instant LOVE! Love the globes and that there will be additions each month. I can’t wait to see the shape shifters; I’m intrigued. I don’t know why globes appeal to me but they do and this new series is fabulous. I really like the Shape Shifters. Wow…you can use them in SO many ways. Those globes are super cute too. What a great release! Wonderful projects today! I love the Shape Shifters and Words to Live By sets! I love the globes! Can’t wait to see the whole series! The globes, shape shifters and word series have such wonderful potential throughout the year! I love those globes a lot!! Wonderful designs! Love those lilies. The color combinations used on the flowers are stunning. So different. Who knew globes could be fun! Great ideas. The lilies are so beautiful. Perfect to lift 5he doldrums of winter! I love what I am seeing in terms of new monthly additions…the globes idea is inspired and I am excited to see these new shapes dies, kind of like Mix and Mat. The kindness sentiments are beautiful. You can never go wrong with more kindness in the world. So much goodness in one post!!! I love the new globe stamps and the kindness sentiments!!! Those Globes are most definitely Glorious! Pink lilies are my Mom’s favorite flower, so it’s at the top o my list. I really like the shape shifters circle. Very cute! Love everything introduced today and the design team’s projects are nothing short of amazing! The Glorious Globes stamp set is a very welcome surprise!! Always nice to have new products with a travel theme. Lovely release and delightful projects from everyone!! I put every single item showcased today on my wish list. LOVE them all! I am in love with the globes! Love all the projects presented today. Love the new Glorious Globes series and the Lillies are spectacular! I’ve been looking forward to hopping around all day after my fast look this morning!! I love all these beautiful color combinations. 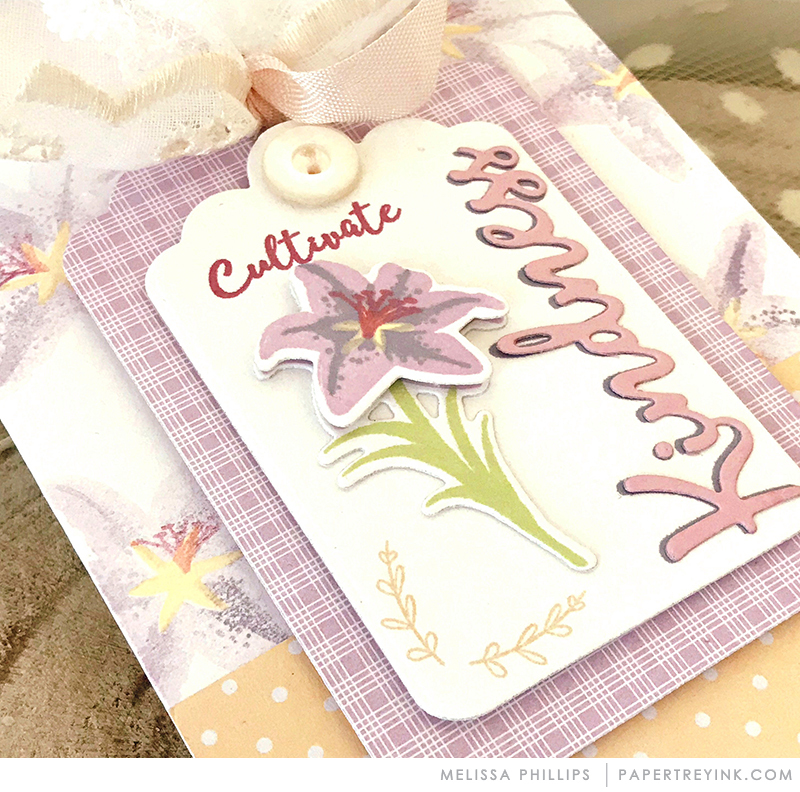 I especially love Melissa’s lily cards…so soft and pretty. Lots of great inspiration today…and I know I am going to need the Shape Shifter Circle….! The globe set is so unique – not like anything else I have. Love it! Ooooh, love the new Words to Live By Series. This series will become a fast favorite! Those lilies are so awesome. I love all of the beautiful cards. Loving the Shape Shifters concept – can’t wait to see more! The Words to Live By series is awesome – what a great concept! 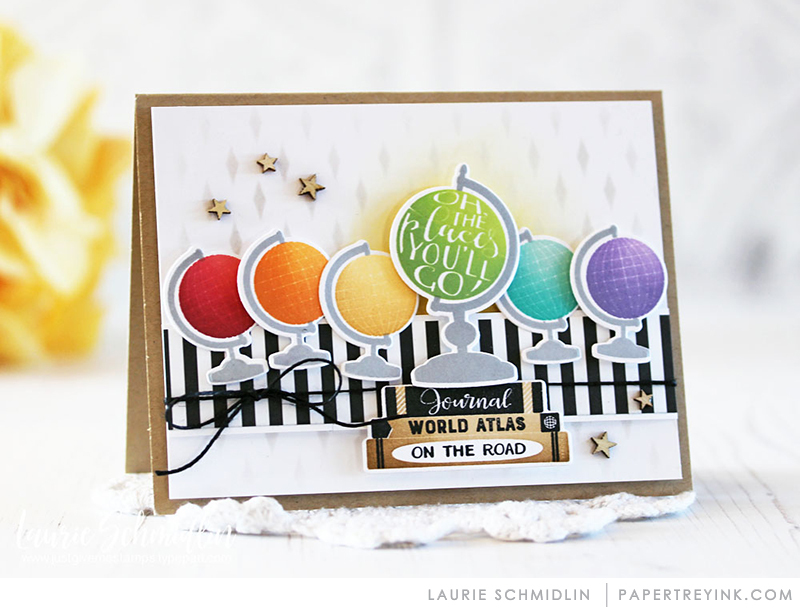 Love the globes, especially done in rainbow on Laurie’s card, looking forward to the new monthly additions for this set! Beautiful projects! Love Betsy’s lilies. Oh my! Wish I had time to create, so I ll just comment. Loving the new release! Globe series. I can’t imagine what all will come out during the next year. PTI outdoes itself once again!!! The circle die concepts looks intriguing. Great projects! That Lilly set will definitely be in my cart! 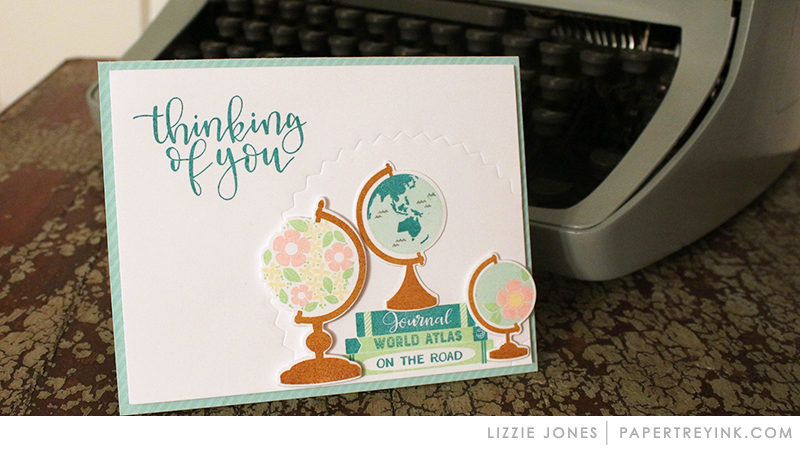 Love the Lillie’s stamp and die and that global stamp/die Is so cute! Love! Love! Love! The glorious globes. The shape shifters are interesting! Oh the Lillies are so pretty! And the globes are unique, so cute! Oh my! All the beautiful work from the designers is stunning. Wow, I’m really loving the lilies and all the beautiful sentiments. And the globes are cute too. Gorgeous new products. Can’t wait until the full release. I love the lilies a lot! So beautiful in so many different colors as shown by the team. Thanks for a chance to win. Love the gloves and the lilies, fabulous projects today! I love the globes & love that there will be coordinating additions for them throughout the year! The lilies make we ready for spring. Nice samples, the globes are really fun! What great inspiration on today’s post! I love the lilies! Beautiful floral cards from the DT. Love the Lillies of the Field set! I love Oriental Lillies! So many great new products! Thank you for the chance to win! Love the globes! Can’t wait to see the rest in this series! I love all the new stamps and dies shown today – no surprise, really. It has been wonderful to see all the creativity shown by the DT. They sure have been working overtime. 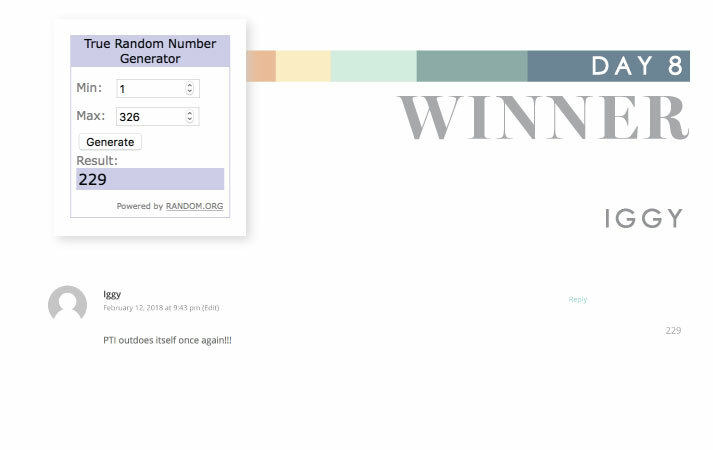 Thanks for all the beauty, and for the chance to win a gift certificate! Just adore those globes, cant wait to see more! I love the Lilies of the Field set. PTI has the best floral stamps! Love all the new items, looking forward to the release. Now I need to make room for the Shape Shifters collection! Loving the lilies, especially in the beautiful soft pastel palettes. Love all the pretty color swatches! It was easy to be inspired to make a card using them. Looking forward to the new Shape Shifters series. I like that they sound so versatile. Amy’s cards were gorgeous! The colors really popped…well done to all the ladies! Oh my goodness! The lillie’s are absolutely GORGEOUS! Happy 11th Anniversary! Betsy’s lilies are beautiful — and shape shifters! The name alone is very intriguing. The circle certainly looks fun ? Lizzie’s new globe series is so unique. And…those lilies are gorgeous! I love the globes! They are stunning. I cant wait to play with them and the gold embossing on the stand/frame really makes it stand out and look so realistic. Love it. What a great idea with the shape shifter series and the lily set is beautiful. I’m very excited to see the globes revealed. I love to use die cuts and these Shape Shifter dies are unique. Can’t wait to see more. Thanks! Love the lilies and the sentiments. The globes are adorable. Fantastic examples!! I love the globes, and having additional add on stamps every month will make it really versatile. Oh my word those globes are amazing!! And I am loving the idea of the Shape Shifters! Wonderful reveal again today! The Glorious Globes Basics are my favorite…especially since my family is spread across the world. Amy’s card is so sweet and colorful. The shape shifters are such a nice addition, and I love the beautiful lilies! I love the globes and the lilies are so pretty! I can see Penned Elegance is going to be a necessity! So pretty! Love the floral globes from the Glorious Globes Basics, such a fun tropical vibe! The globes are definitely one of my favorites so far .. can be used for so many occasions! Fantastic inspiration!! The globes are so fun! Beautiful cards! I love all the new products, but the globe set is really unique and I can’t wait to see the additions to it in the coming months! Wow, I Love the Color Challenge. So many pretty entries. I hope I have time to enter. Happy 11th Anniversary PTI! Hope I get a chance to make a card for this challenge. Great designs by the DT. Really beautiful cards! The globes are a unique concept. Looking forward to playing along in the challenge! Oh, I want those lillies! Among other things…. These Lilies are beautiful! I know what I’m ordering! Those little globes are adorable. I will be putting those into my cart on the 15th. The lilies are lovely – so much beautiful detail! All the projects are so beautiful! Really love the shape shifters. Looking forward to the Words to Live by series this year. I love that it is kicking off with Kind and Kindness. Can’t wait to see all the positive vibes this series brings! The lilies are so pretty! I especially like Betsy’s Easter card! These floral projects are amazing! Gorgeous inspirational cards!! I love color challenges! There’s so much that I love about this release! Everyone’s projects are so inspiring and so amazing! 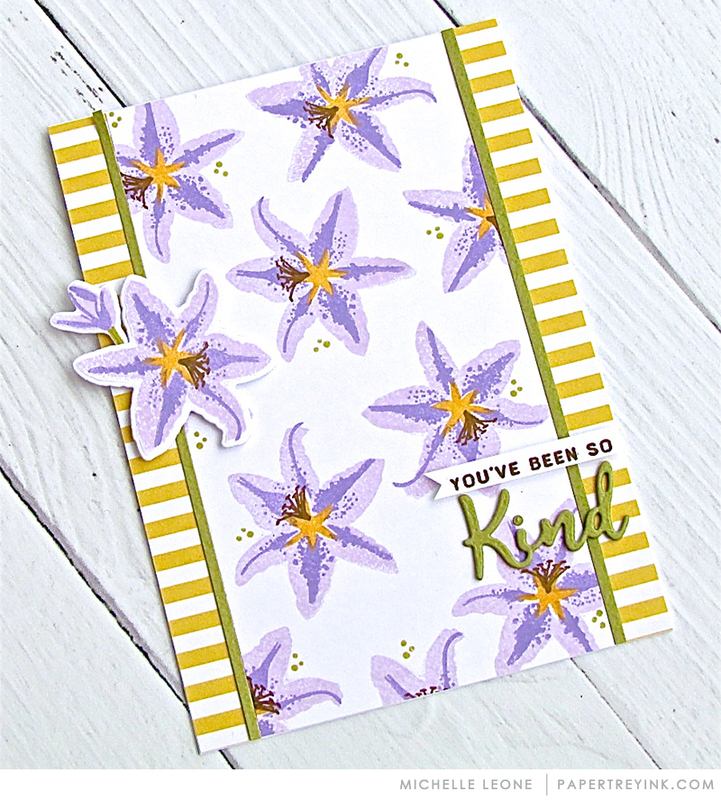 Love the gals’ color combos on today’s creations – the red lillies with the yellow polka dot paper – WOW! 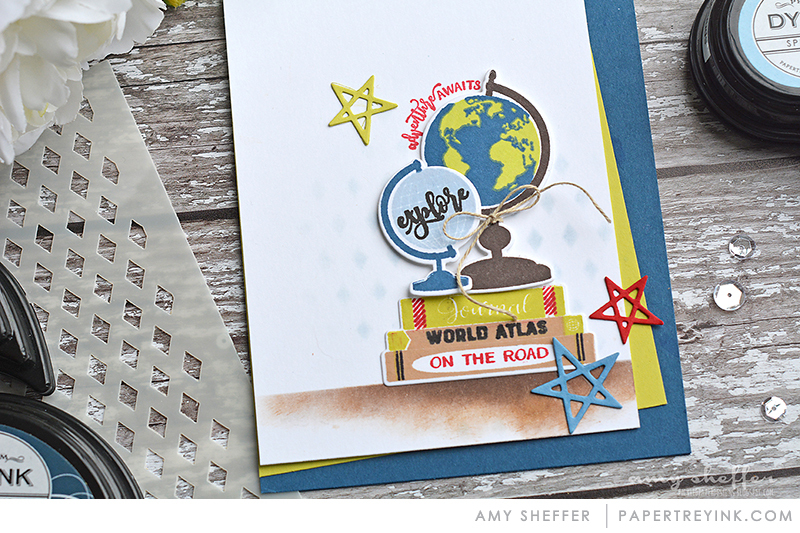 So many fun and glorious ways to use the GLORIOUS GLOBES stamp set! 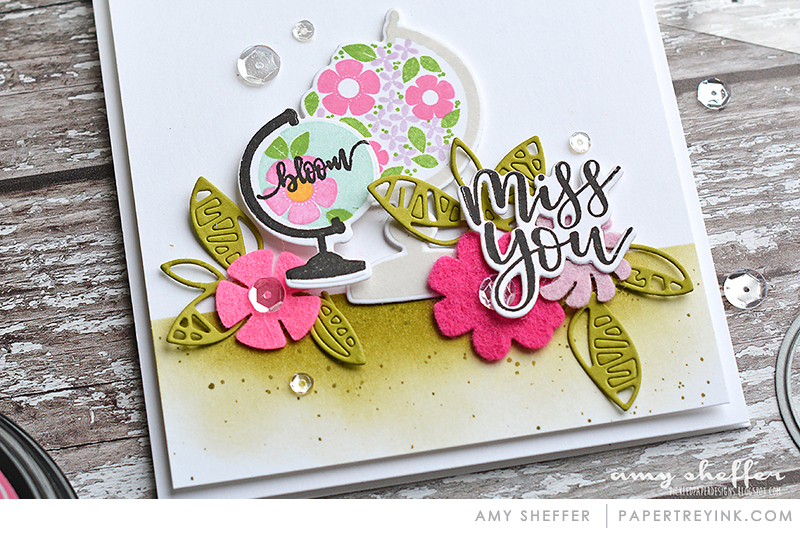 I love the sponging technique in Amy’s card to “hold” the stamped card elements, and the delicate diamond background she created. Simple details make a big difference! Such pretty colors today, they take me right into spring! I could never choose just one of the teams creations for inspiration – each one of them make me want to grab my supplies and get started! Love the globes and the circles! Fabulous and creative projects today. So inspirational. Love the globes and all these amazing color combos! I love the bright colors Laurie used! Great cards all! Love those globes! I was wondering how a monthly release of them would work but I love the flower globe! Perfect timing. 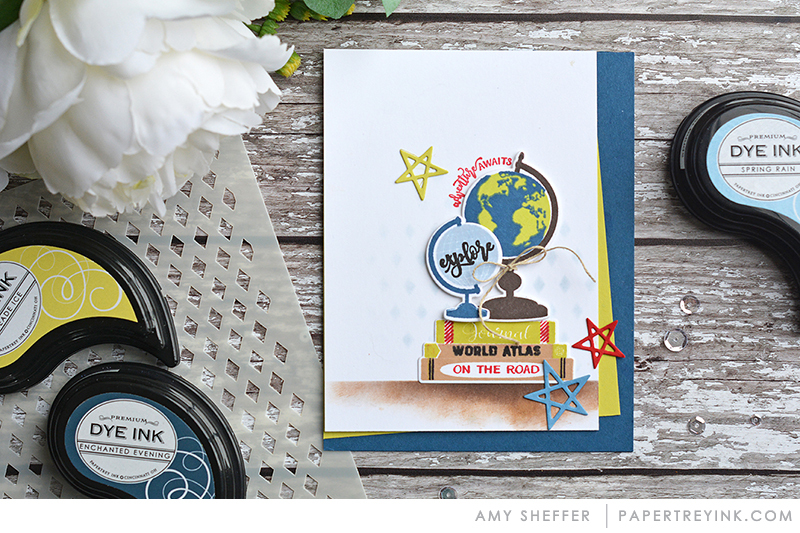 I saw a globe just a few days ago and said to myself that I needed to find a globe stamp! And those lilies are fabulous! Ohhh… I love the globes!! And lilies are one of my favorite flowers! Cannot wait for this release! Woohoo! 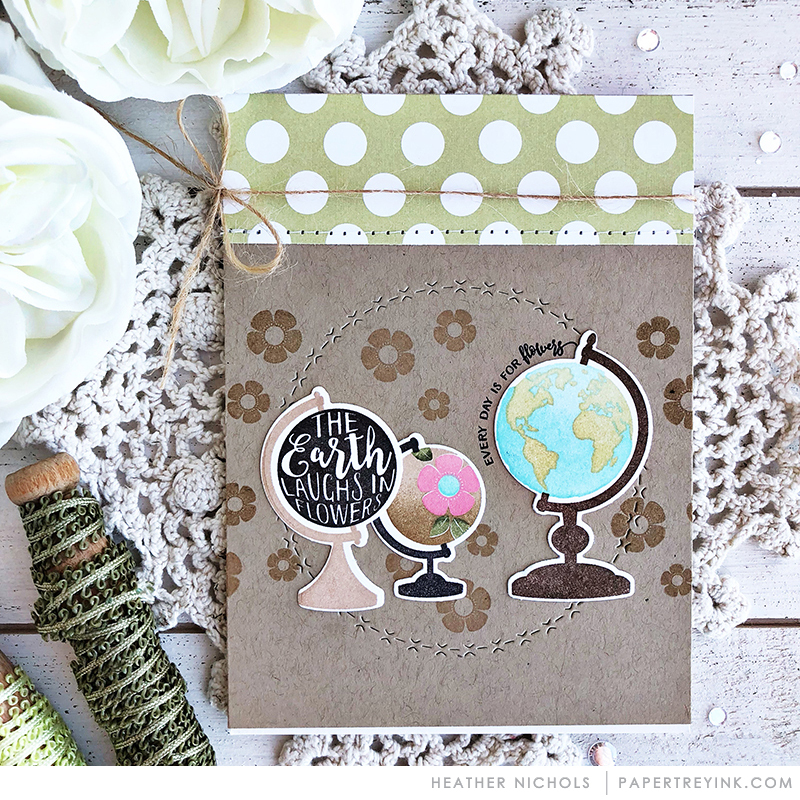 Love the globe stamp and die! Love the shape shifter dies! Love the lilies and the globes are awesome. I love the versatility of having various sizes and the cool inserts for the globes!! Aww, you’re killing me with those globes! Awesome set! What fabulous projects from the DT! Love the lilies! Gorgeous inspirations from the Design Team. I’m always smitten with PTI and SO inspired. So love the adorable globes and anything having to do with Kindness, can’t wait!! Words to live by is a great new series. Can’t wait to see more through the coming months! Beautiful lilies too! Gorgeous lily image and samples. One can never have enough flower stamps/dies! 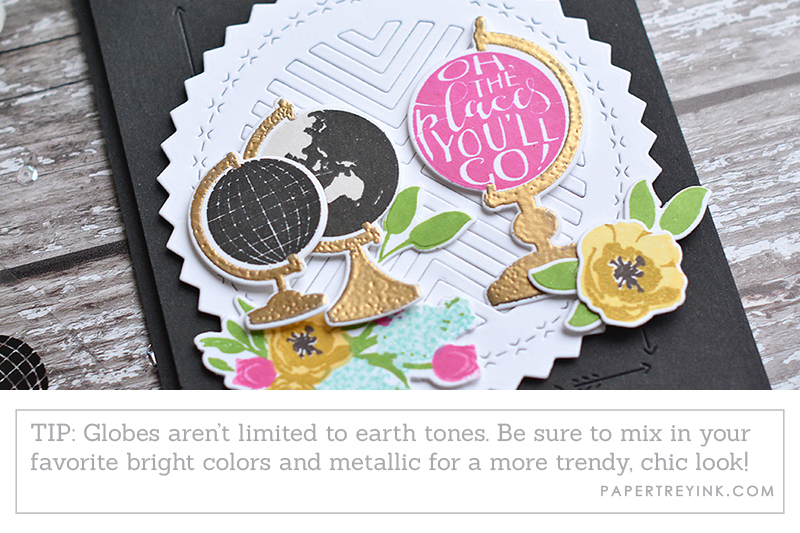 Who knew I needed a globe stamp set?? lol Totally adorable! Way to go, Lizzie! Love this set! 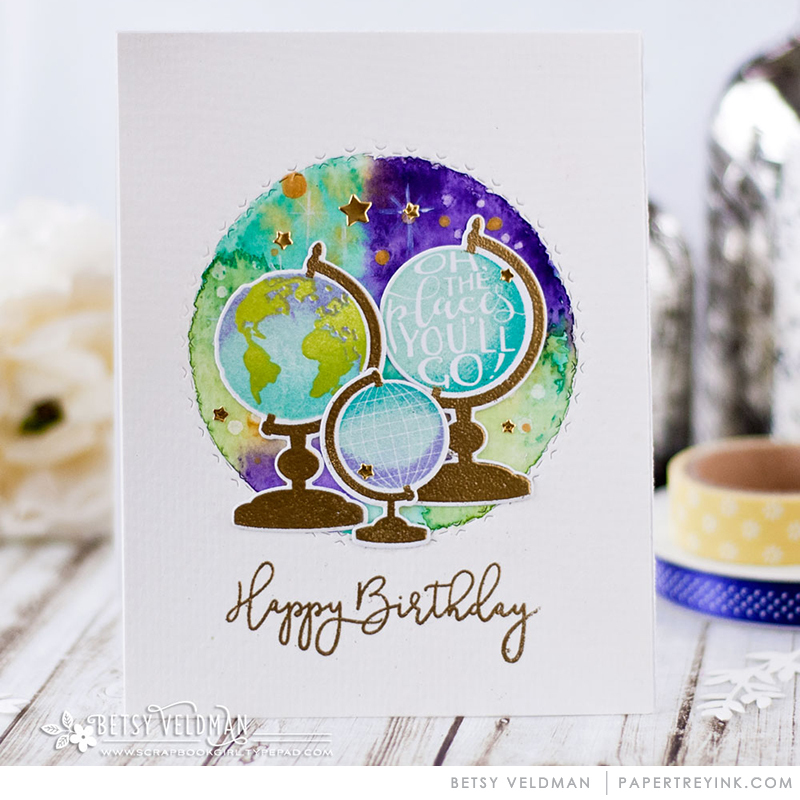 I love the Glorious Globes set, and Betsy’s card is my favourite of all those featuring it! I just love the globes! Can’t wait to play with them! The designers are amazing! They come up with wonderful ideas to share with us. They get my juices flowing. I really appreciate all the samples you provide. It’s great inspiration. Good release! I don’t have enough ink colors to participate with a card in the challenge, but trust me – there are plenty of inks in my cart for the Anniversary Release! Thank you for the chance to win! The globes are gorgeous! Definitely going on my wishlist. Love those globes! And new ones monthly? I can’t wait! Globes! Such a fun set! I can’t wait to add the to my collection. I have a beautiful old globe so am definitely a fan. Can’t wait to see all the new ones. Fun globes! The color combos are so helpful. Looking forward to see more of the Shape Shifter series. 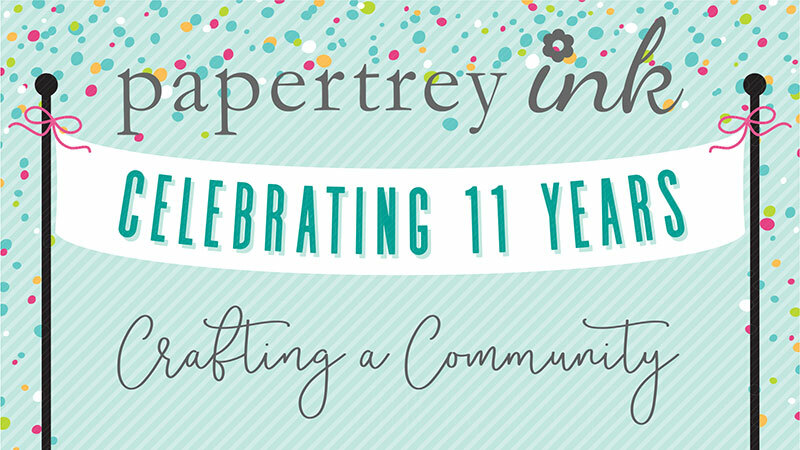 Welcome to Papertrey Ink! We specialize in clear stamps and have our own line of exclusive paper crafting embellishments and accessories. All of which is created by stampers for stampers. We pride ourselves in only providing the highest quality product at a reasonable price. Thank you for connecting with us. © 2019 Papertrey Ink Blog.